A solid marketing move, looks good too. 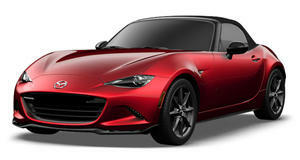 We've barely even seen the 2016 Mazda MX-5 Miata in standard trim yet, but Mazda would like us to know there are optional extras available. To this end, it has built the MX-5 Miata Accessories Concept, a not terribly creatively named rolling advertisement for MX-5 extras. Revealed in Chicago, it's really quite a sensible move, to give potential buyers a look at what is available right from the start, and in this case it even includes optional paint, known as Ceramic Metallic. Then there are the 17-inch forged BBS wheels, which fit nicely over bigger Brembo brakes. There is a trunk-mounted luggage rack, made from carbon fiber, naturally. And then there's the aero kit, which includes a front air dam, side sill extensions, a rear bumper skirt and a lip spoiler. There was unfortunately no word on an optional hardtop, which we know a number of Miata fans will be eagerly awaiting, and neither was there any mention of power upgrades. We're expecting that this list will grow during this generation's life cycle, but this is certainly a good start.